I am late in posting November's challenge, but I guess its never too late to finish up a DBers Challenge!! 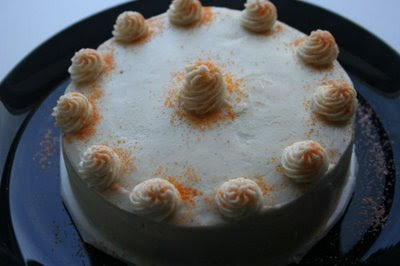 The challenge for the month of November was a signature Caramel Cake.by Shuna Fish Lydon of Eggbeater. Our host was the lovely Dolores of Chronicles in Culinary Curiosity and co-hosting with her were Alex and Jenny . The recipe is by Shuna Fish Lydon. I didn't want to make a big cake so I made a 6" cake, layered it into two and frosted it with the caramelized buttercream. This one is a lot of sugar, so halving the recipe was definitely a good idea! I decorated the cake with buttercream swirls and topped it with coloured sugar. The cake was differently delicious, but way too sweet for us! It was a good experience with caramel though. Another challenge done for now! OMGGGGGGGGGG NAMI!! Why do u make me sooo hungry and jealous?????? I am feeling really hungry kane.. i simply love the way u take such awesome photosss!! simply superbbb!! Oh yeah the light is biggest issues for clicking, i can feel the gloomy shadows.... But the cake is just attractive! Your cake looks beautiful, great job with the frosting! I need to start cutting the recipes in half, there are only 2 of us and it was alot of sugar! Just a superb cake Namratha.I loved the idea of coloured sugar. looks so soft and perfect. Why is kosher salt used ? The looks so yumm. ANyway i like seeing this late as one was seeing so much of this cake in one day, so it is better to seen one after sometime. Better to be late than never too. the cake looks heavenly! I wish i could eat it! Thanks Pravs! Kosher salt is used to cut back on the sweetness. :) Thanks Happy, yup too many cakes on the same day right? Its nice that you did the challenge all the same. And sweet it was, but your cake looks lovely. I love your cake! The decorations look beautiful! That looks awesome.. love all things caramel. The cake looks simple yet elegant Namratha. Reg the pasta, it's whole grain spaghetti and not whole wheat.